Zoe: "‘How is your sewing stash spread?’ would probably be a more appropriate question! I recently moved into a tiny studio flat (i.e. basically one room) that I share with my boyfriend, so I don’t have enough space to have everything with me right now. 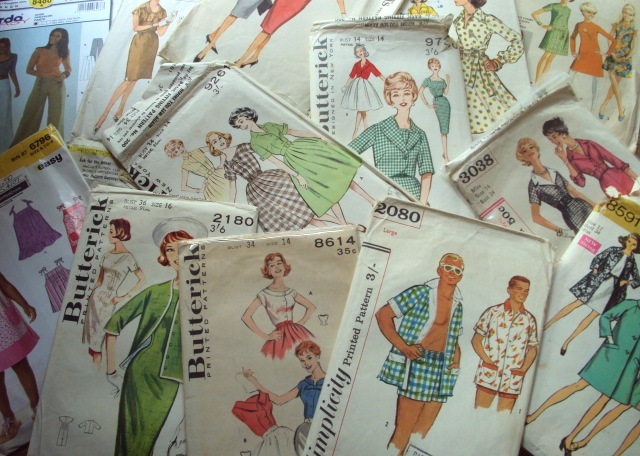 I have selected the sewing patterns and pieces of fabric I thought I might use before Christmas to bring with me here to Brighton, plus I brought most of my notions, both my flatlock and overlock machines and enough pattern cutting paper to keep me out of mischief for the foreseeable future. It’s all crammed into these drawers and affiliated bags in the corner of the room. I managed to bag the area with the only natural light by the only window in the whole flat so I consider myself lucky! The rest of my sewing stash is in boxes under the bed in the spare room of my long-suffering parents’ house. My plan is to use up the fabric I have with me, then pick up more pieces to use each time I return to visit them. There is a lot so that may take decades unless we move into a bigger place soon, which I desperately hope to do!" You're the brains behind "Stash Bustin", and you recently did a big fabric and pattern cull in preparation for your move from Barcelona to the UK. What's your de-stashing strategy? Zoe: "I won’t lie to you, the cull which occurred in that last couple of weeks was intense. I sneaked as much of my beautiful fabric back as I could, using it to protect computers being packed into boxes and the like! Basically, if I couldn’t envisage a direct use for the piece of fabric, it was gone. The smaller pieces I gave to a friend who works with children to use for craft projects; the larger pieces, my Burda sewing mags and thread were donated to a lovely girl I met through the Barcelona Burdastyle sewing group who was just starting out sewing. De-stashing is easier and more meaningful if you have grateful recipients who you know will make good use of it. I never found any means to recycle unwanted textiles whilst I was in barcelona, I can’t abide the thought of sending fabric to the landfill." How did it feel to do such a big cull? Is there anything you wish you'd saved, or are you happy with your lighter stash? Zoe: "At the time it felt very brutal, because at the same time as culling my stash, I was culling my wardrobe and saying goodbye to close friends and my adopted home. Upon reflection, I am very pleased with my edited stash, plus rediscovering the fabric and patterns that I’d left at my folks whilst I was in Spain was a joy when I returned! I kind of wish I could of hung on to the black sateen and navy twill that I had metres and metres of which I gave away, but it was just too heavy and bulky. I also wish I could of hung on to my epic haul of sewing thread cones, as the discovery of them one night whilst walking with some friends felt so serendipitous! But on the whole, no regrets!" Zoe: "I’ll confess, I’ve not been able to kick my pattern buying addiction, so that area of my stash is repopulating itself with disturbing speed! I’ve got some vintage beauts that I can’t wait to make once some sensibly winter-appropriate garments and obligation projects are out of the way. I’ve also bought some new fabric since I returned to UK, but only with an immediate project in mind. My button stash is also very close to my heart. I can spend hours sorting through them all!" Are there big differences between fabric shopping in Spain and the UK? 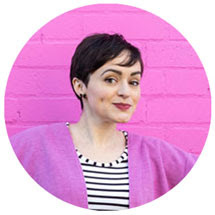 Zoe: "This post I wrote for the Colette Patterns blog sums up the differences pretty well. To massively generalise, shopping for fabric and notions in Spain is like heading back to the 1940s." When did you first start sewing and how did you learn? 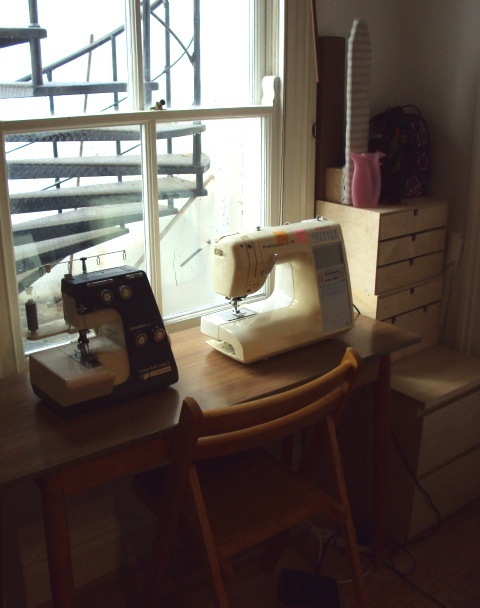 Zoe: "Like many stitchin’ ladies, I watched my mum and nan sew from an early age which encouraged me to try my hand at making dolls clothes and stuff. Both of them sewed as their main source of income at some point in their lives. I studied Fashion Design at university which obviously taught me a lot. Since then, I’ve worked in various roles in a few clothing companies and always kept my eyes open, which allowed me to pick up a few tricks. I sew all the time, but I don’t read as much about techniques as I probably should." 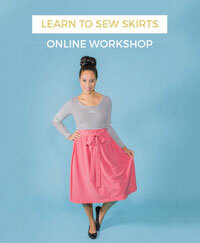 What are you planning to sew next? Zoe: "Currently, I’m working on a (hopefully) warm wool coat using a vintage Vogue pattern to protect me from the impending UK winter. Some crazy shirts for my boyfriend are on their way. Some new work appropriate pieces for my best mate and then hopefully some tasty vintage inspired garments for me!" Thank you Zoe, you are an inspiration! How about you, readers? Have you got any top tips for destashing? Or are you swimming in a sea of fabric and patterns and notions? Do share! Previous Stash Amnesty interviews - Rachel Boo Dogg, Rachel Red Lips and Jen Pretty Little Pictures.